I feel like dancing and singing that little song from Dora the Explorer. This morning, the WKU Benefits Committee met to vote on adding domestic partnership benefits (again). Wow. I’m so happy I hardly know what to say! I, along with many, many other amazing people here at Western Kentucky University have been mobilizing our butts off for the past several weeks. This morning was to be a demonstration to demand equal benefits for our LGBT faculty and staff. Instead, it was a celebration. There was tears and hugs and singing. It was a beautiful sight, and it was unbelievably gratifying for our work to have paid off. We’re celebrating tonight at a local hangout, Greener Groundz. I can’t wait to update more thoroughly on what’s been going on. Stay tuned! It’s a tale none will soon forget! I’m resting for a bit, and then I’m off to celebrate! Edit: As per my blog note, I’ve been so busy, but I will share the details in another post! The Benefits Committee may have recommended against it, but we’re not giving up! Yesterday afternoon, I received word that the faculty were holding a silent protest outside Wetherby–one of the administration buildings on campus. I tossed my laptop aside and rushed up the Hill. Word has spread across campus, and other events are being planned, in the hopes of convincing the administration to do the right thing. I have heard, but cannot confirm, that the President of the university, Gary Ransdell, is on our side. If he is, that’s great! More visible support is always welcome. Unfortunately, Gary cannot do this thing single-handedly. I first mentioned the issue here on Wednesday, when the news emerged that the Benefits committee declined to give their recommendation for Domestic Partnership benefits, yet again. Today, the Bowling Green Daily News covered it. Tony Glisson, who is director of WKU Department of Human Resources and a member of the Benefits Committee, isn’t saying much about the decision, or how they got there. In fact, we don’t even know who all sits on the committee. The only members we know of are Glisson, and the appointees from the university senate, which totals three or four out of the fourteen people that sit on the committee. Secrecy at a public institution on issues and decisions like this are shady. Committees like this are supposed to keep minutes, that is, a record. But searching Western’s website reveals nothing–the committee has no page, nor minutes posted anywhere on Western’s web site. The closest you get is mentions of the committee on University Senate minutes, which are only easily found through the search box. Glisson claims that the committee’s decision is based off of the amendment in Kentucky’s Constitution that bans gay marriage. However, the University of Kentucky, Northern Kentucky University, and the University of Louisville all offer domestic partnership benefits to their employees. Also, because it is always great to hear from supporters, contact Dr. Minter here and let her know that you appreciate her vocal and enthusiastic support. Lastly, if you’ve got time to spare, comment on the Daily News article expressing your support for domestic partner benefits. The Daily News requires you to register first, so put this last on the list if you’re short on time. Any public, vocal support helps! 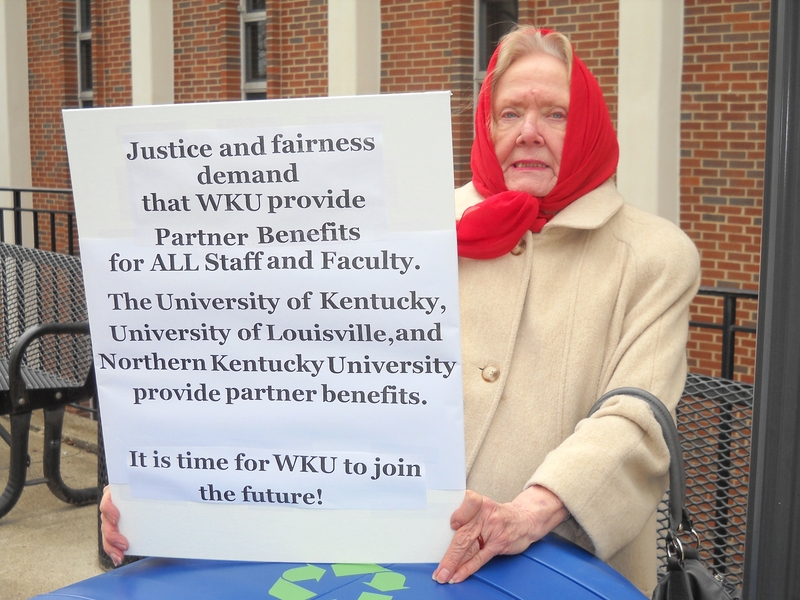 Skylar Jordan, a good friend of mine, has been trying to pressure the Benefits Committee of Western Kentucky University to add domestic partners to the list of those family members that share the benefits of Western’s employees. He first brought it up last year in our Student Government Association, who passed a resolution supporting domestic partnership benefits. Next it came up at University Senate, where we also got a resolution passed supporting DPB. But the Benefits Committee ignored both faculty and students, and voted against it. Skylar wrote his response, published on his blog, as well as in the student newspaper. He laid out a very eloquent argument; check it out here.